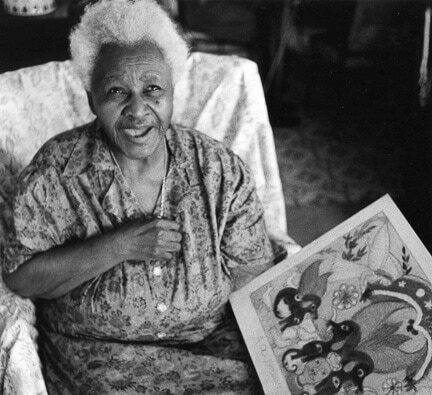 Minnie Evans was a self-taught artist inspired by books of the Bible to create vivid canvases of her visions of green animals, angels, and prophets. Her work as gatekeeper at Airlie Gardens in Wilmington provided her with opportunities to absorb the color of a lush earthly landscape. In her authoritative, booming voice, she proclaimed, “Art is a mystery.” Today her pictures have been exhibited in major galleries and museums.